Accidental deletion can always happen, this is why we should have backup copies of our important files. Similar to other media, USB flash drives is also prone to risk of accidental deletion, corruption, being formatted and others. Data loss is more worse if your only copy of the file being transferred is on that media. 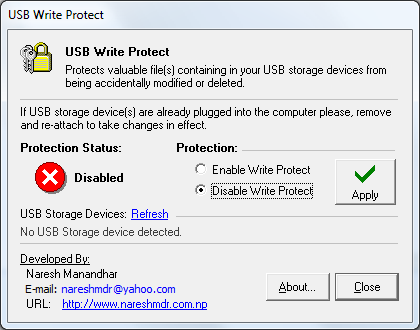 To prevent accidental situation such as this from happening, you can choose to write protect your USB flash drive with USB Write Protect become useful. A small portable tool that can make your USB flash drive write protected. Its usage is easy, run the app, select "Enable Write Protect" and click Apply. To revert back to write state, select "Disable Write Protect" and click Appy.